Help protect a key stronghold for a species in peril. It will take almost a century for forest elephants to recover from the intense poaching they've suffered since 2002—and that's without any further killing. We must protect them and their key habitats before it's too late. 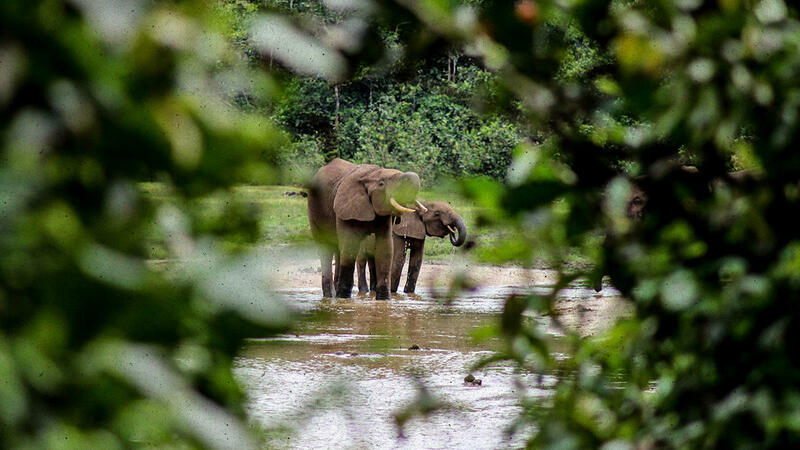 At the heart of the world's second-largest rainforest, Nouabale-Ndoki National Park is home to impressive biodiversity, including a healthy and important population of forest elephants (which are believed to be more endangered than savanna elephants). Through a partnership with the Congolese government, WCS helps manage the park. In that role, we are working tirelessly to stop illegal poaching, a grave threat to the park's elephants. Rangers like Frank Moutengue (below) are the heroes of this effort, putting themselves on the line to protect these animals from armed poachers. In his eight years in Ndoki, Moutengue has risen to become one of the most respected rangers around. Today, he's the head of Unit 2, one of 12 units that patrol the park. As they forge ahead with the dangerous and difficult task of combatting poaching, let the rangers of Nouabale-Ndoki know that you stand behind them. Send a thank you note today. THANKS FOR EVERYTHING THAT YOU DO FOR WILDLIFE! We've never met, but we have something very important in common: love and respect for elephants and other wildlife that live and thrive in the park that you patrol. I want to thank you for dedicating your career to protecting these amazing animals from poachers, traffickers, and other threats to their survival. Poaching and trafficking are growing more sophisticated every day and as species like elephants are pushed closer toward extinction, your work to defend these amazing animals is more important than ever before. Whenever you set off to do your dangerous and difficult work, I hope you know that I and thousands of other wildlife advocates like me are thinking of you, and we are grateful for everything that you do.